I see viewers of ON THE SCENE have been checking into the blog. Thanks. ON THE SCENE airs on News 12 New Jersey 8:30am, 11:30am and 4:30pm today (Sunday, July 15th.). The show is a recurring special presentation. It’s not on every weekend. If you follow me on twitter @JohnBathkeLive you’ll never miss a new show or an encore because info is posted there. Showtimes are always the same (as listed above) when the show does air. The next air date will be announced in the coming week. And if you enjoy ON THE SCENE please let me and the station know your feedback. Some of you will be checking out the blog this weekend or finding it through internet searches after seeing ON THE SCENE. (The show airs on News 12 New Jersey at 8:30am, 11:30am and 4:30pm Saturday and Sunday). So, here’s some back story about my Joey Pants interview and about the other segment in the show, the Shakespeare Theatre of New Jersey. I had never met Joe before we came to his apartment for the interview. It was a friend of mine, the playwright and director Charles Messina, who suggested he would be a compelling interview after directing him in a play reading earlier this year. I believe what makes a riveting story is when someone is willing to tell the truth about the beginnings of their life. In many ways it’s the most fascinating time and certainly it’s what shapes the person who they are today. Joe, as you saw in my interview, put it all out there. To be able to talk about his stepfather being a mobster, growing up in a family of thieves…well, that takes an open spirit. Let me know what you thought of this interview. As for the Shakespeare Theatre of New Jersey which is also featured in this episode, it’s the 50th anniversary season. But I did not want to do a historical piece…something looking back on five decades of plays. And certainly there’s not enough time in the world to parse the nuances of Shakespeare. I wanted this piece to be about the passion the people who work there feel for Shakespeare. Why are they moved by his words, how did Shakespeare change their life, and what keeps Shakespeare fresh and relevant to them. I hope we achieved that. Those of us who work on writing, producing, shooting, and editing ON THE SCENE each have a vision for our part in the production. Yes, I am the host and producer of the program but a small team of creatives work with me in the course of putting together each segment one by one till a whole show is built. One thing I’ve learned, what we notice in the finished work is often radically different than the things viewers pick up. When each new episode airs it’s a fascinating time for me. Spent the last two days hard at it in and edit suite…with no air conditioning, mind you…putting together this weekend’s new ON THE SCENE. Working with a brilliant editor does help compensate for the suffocating conditions, however. Tune in to News 12 New Jersey this Saturday and Sunday, July 14th and 15th at 8:30 AM, 11:30 AM or 4:30 PM for the show. The first two segments are my interview with actor Joe Pantoliano in which she shows me the neighborhood where he grew up in Hoboken, New Jersey, opens up about his battle with depression and talks about “The Sopranos” on which he starred for two seasons. These are raw, honest, compelling pieces with Joe and not to be missed. We also go backstage and into rehearsals at the Shakespeare Theatre of New Jersey which is celebrating its 50th season of the Bard and works by other classic playwrights. I was at work till midnight Friday. Holed up in an edit suite. I was by myself but I felt as if I had company. 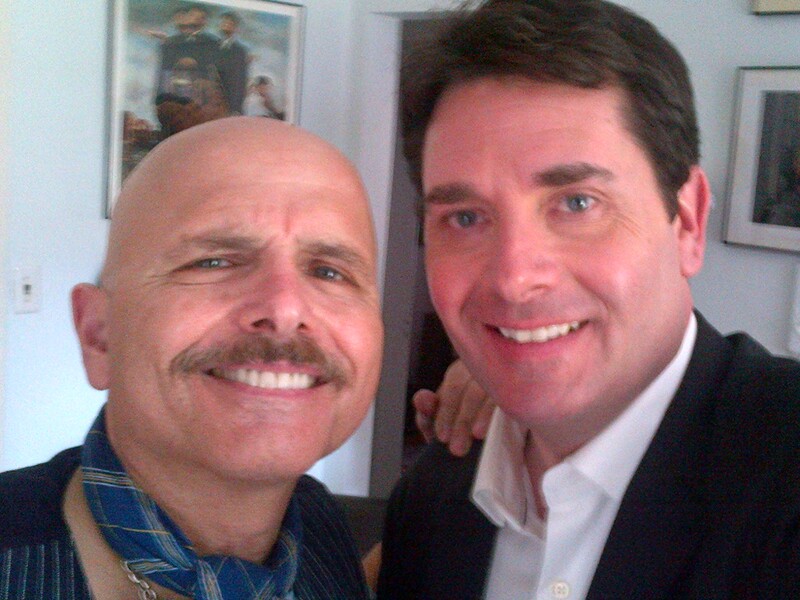 I was watching the interview I taped with Joe Pantoliano the week before. Can’t wait for you to see this. This is the most intimate interview I’ve ever done. Joe doesn’t hide his feelings, his compulsions, his family history. You’ll be hearing about his wiseguy stepdad…and by that I mean he was in the mob not a smartass…his mother who’d steal money from her own son, his descent into mental illness and the battle he’s waging to stay relevant in Hollywood. And if that’s not enough, he washes his dog. And breaks a few stones with the old Italian men hanging out in the neighborhood in Hoboken, NJ. This is going to be quite the piece for ON THE SCENE in just two weeks. Much more to come about it here on the blog. You are currently browsing the John Bathke's Blog blog archives for July, 2012.